A north-east road is due to close for two weeks for “essential resurfacing”. Part of an Aberdeen road is to be temporarily closed at the weekend. Council chiefs have imposed a temporary parking ban on an Aberdeen road while work is carried out. 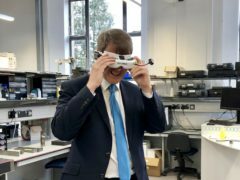 Universities and Science Minister Chris Skidmore viewed the world through the eyes of a miniature robot during a visit to a laboratory. An Aberdeen road will be closed to allow the installation of a new footway. A section of the A90 is to shut for up to an hour as part of planned roadworks. Part of a city centre road will close for BT to carry out repair works. An Aberdeen street is due to be closed for work.